Our family has started the long drive home. The deer have come and gone. 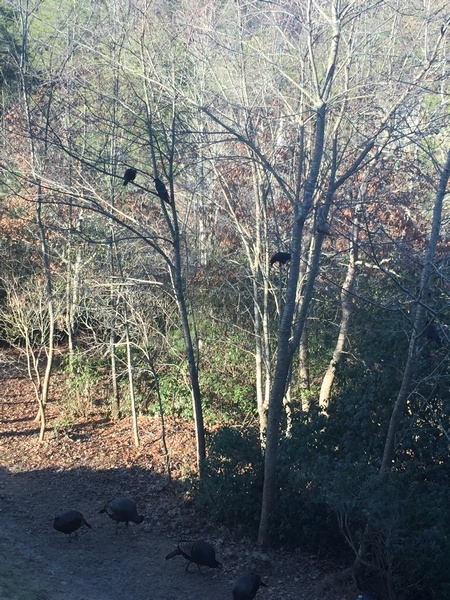 What corn and seed they didn’t eat is picked over by turkeys and anticipated by crows. It was a fun and relaxing Christmas this year. We kept it simple. Each of the three who came to visit will return to keep Lee company while I am in Australia. After getting all the guest rooms put back together I photographed each of the kitchen cupboards and drawers with their contents. I noticed that not too many of them knew where things go. So now when they open a cupboard there will be a picture of what goes in there…..and how. A good idea I think. When I return things should be pretty much where they need to be. 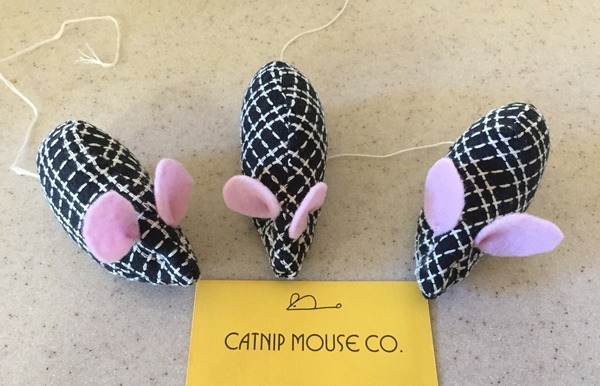 Our daughter received a new sewing machine for Christmas and tried it out making catnip mice for her cat friends…our’s included. I still had her business card from forty years ago when she hired her brother and a neighbor girl to stuff them with catnip. Her closet where the “hired help” were kept working on the line was a bit of a sweat shop with dried catnip, fabrics, sewing machine and stuffing. A local paper did an article on her entrepreneurship that resulted in several callers wanting her to come and harvest excessive amounts of catnip. Here are the three she made using a scrap of two sided cotton I bought from the Dairings in Australia and a bit of pink felt and book binding thread. She also got me sorted out with my new computer and gave me a battery docking station for traveling and away from a power source for charging an iphone. And for fun some lenses for the iphone. 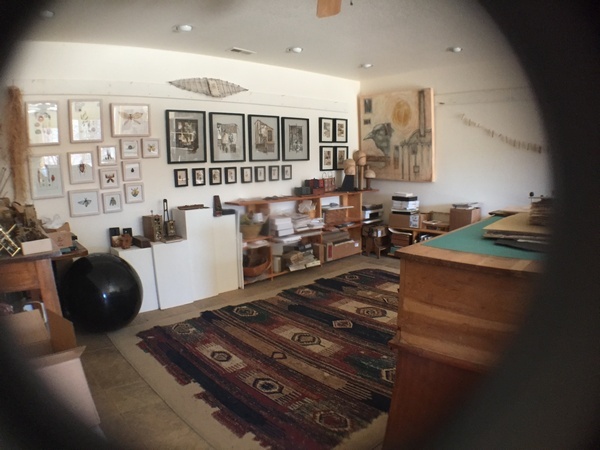 Here is the studio using a combination of lenses. Blurry but pulls a lot into the frame. 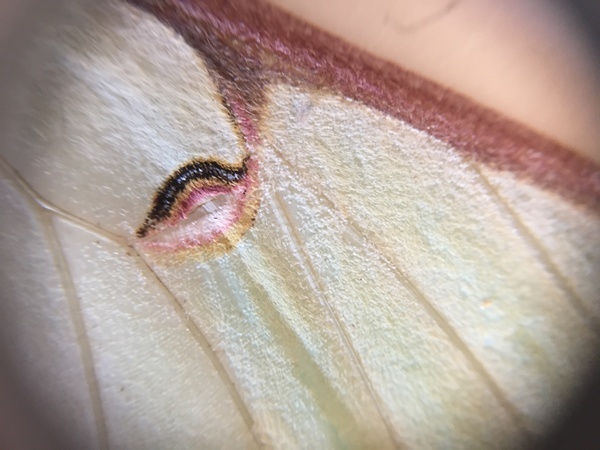 And then the macro lens alone to do this detail of a luna moth wing. I like the macro lens. 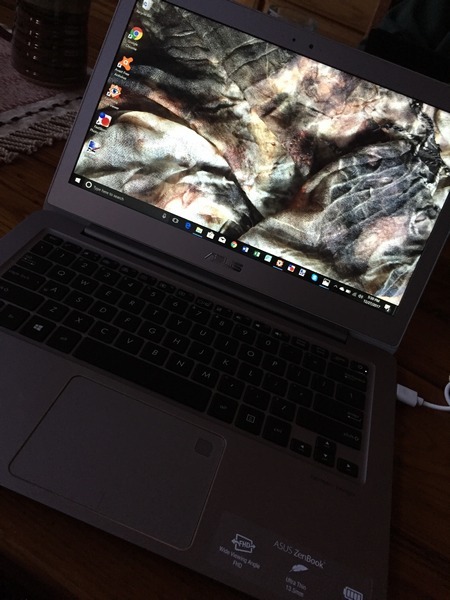 And here is the new computer, an Asus Zen, that is very lightweight. 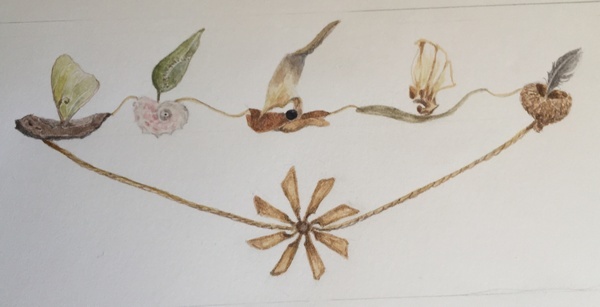 The image for the wall paper or background is from a picture I took of the scarves I dyed at the Botanical Studios in Australia. The last of those were given to two of our three guests and our masseuse who comes the day after Christmas each year to give each of us an hour of heaven. 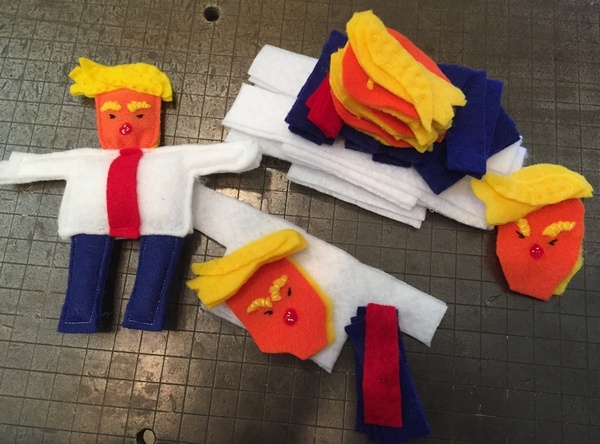 We also had time to finish off some pincushions to get in the mail. And then before you knew it the week was over and it looks as though no one was here. In about three more hours they should arrive home. I did have time to work on another of the boat series. Still not sure where this is going but don’t they feel like some sort of travel back to childhood? I will just keep working on them. The next one will be air ships floating up into the sky like an ascension of balloons. And from our son came the makings of a pretty drastically bad drink made with only the cheapest whiskey one can find mixed with diet Fresca and about four ice cubes. What makes it palatable is that is should be served in a Jefferson Cup ( metal similar to pewter and bowl shaped). He actually found a set of four to present along with the mix and cheap whiskey. We only drink these when we want to remember our friend who passed shortly before her 100th birthday. This was her favorite drink that she often served with popcorn cooked just right. She, Pacia, was also the reason we decided to come up with the book I wrote and editioned titled, The Spirits Bar. It is about a bar we open when we miss those who have gone before us. The ones we loved sharing a drink with, the ones we would like to see come back for “one more round”. Here is the book. My friend who comes each year with the kids got it out so I could read it while we ate popcorn and drank Pacia’s favorite drink. I will take a new picture with the Jefferson Cup. I am finishing off the Aristocrat whiskey and Fresca while having a five o’clock phone visit with a friend. 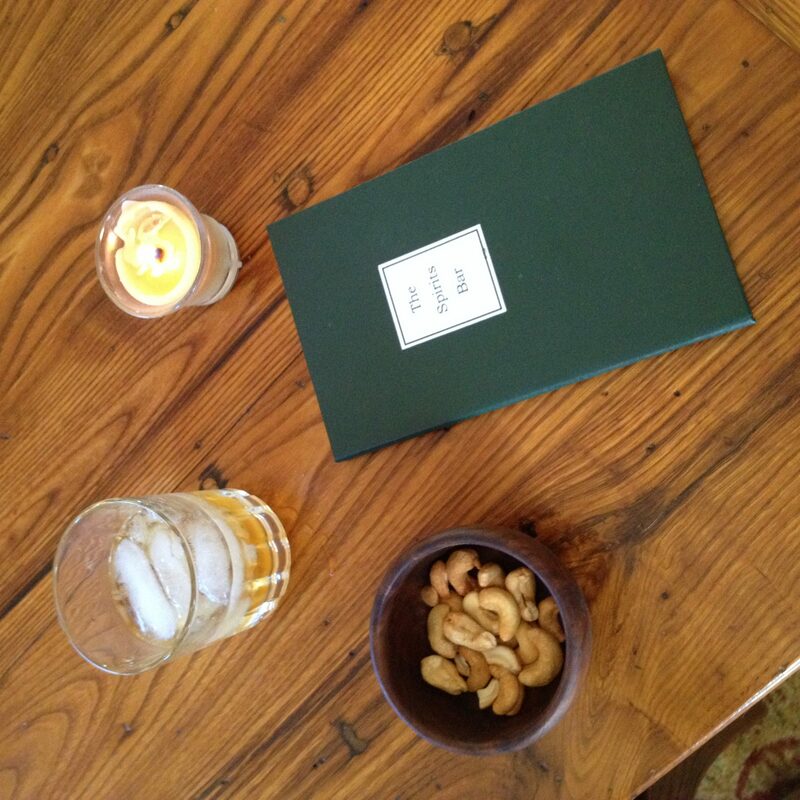 We usually drink scotch on these calls but Pacia is still on my mind as well as the thoughtful son who found these ingredients to make a perfect gift, not to mention his encouragement for me to write this little book. Til next time. I am off to the Spirits Bar.